Full steam ahead from Devin to Hainburg and back! Come with us to explore the country beyond Bratislava’s borders on foot or by bike! Embark on the Carnuntum boat in the port Devin and discover unexpected beauties along the Danube! The ship for 49 passengers is a great way for all those who want to escape from the crowded tourist centre of Bratislava and explore the country look of the Danube Region. 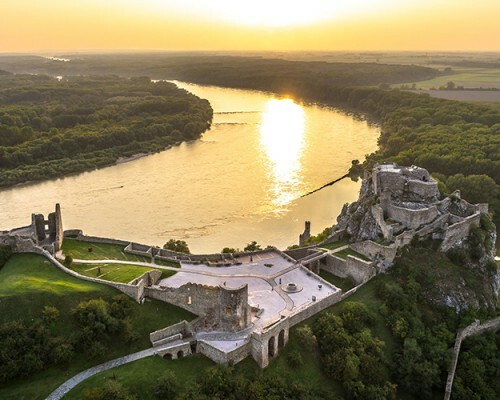 Without a doubt, special river atmosphere and remarkable views of the Danube-Auen National Park and cultural monuments will make your trip a memorable experience. The boat is suitable also for bikers. Devin – Hainburg 11:05 a.m. – 11:50 a.m.
3:50 p.m. – 4:35 p.m.
Hainburg – Devin 10:30 a.m. – 10:55 a.m.
3:15 p.m. – 3:40 p.m.